New items for the website, I'm hoping to get them on there this weekend, but for now they are on Etsy. I've made my first watch! 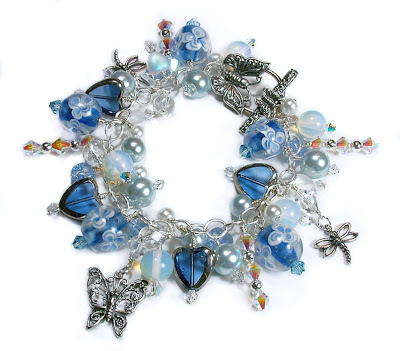 and of course another cluttered charm bracelet this time in a nice gentle blue colour. 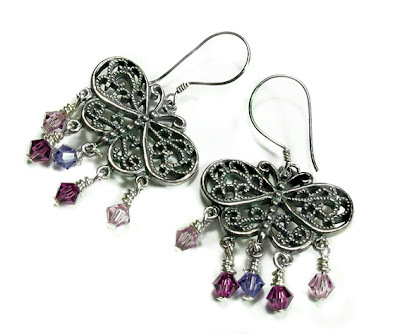 I've also had chance to make a pretty pair of butterfly earrings with little jangly Swarovski crystals dripping from them. I also managed to make some earrings with my PMC kit and I'm feeling rather proud of myself, I'll hopefully have pictures of these to show over the weekend too! 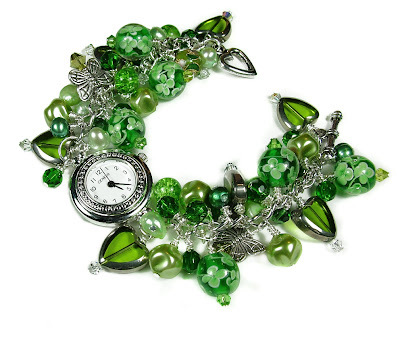 I love your watch/charm bracelet, green is one of my fav colours and you've used some wonderful beads! Thank you Mandie! Nice to meet you too, I'll pop you a link up on here as well. 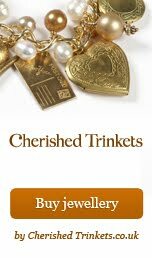 You're jewellery is lovely... I'm always admiring from afar!